Promoting your business on WaccoBB.net! Thread: Promoting your business on WaccoBB.net! We offer several types of advertising:. Banner ads offer the highest level of visibility for your offering. By presenting your business with an attractive banner ad you demonstrate your commitment to both your business and your community. Our users know that all our sponsors are fellow community members whose quality offerings are worthy of extra attention and whose support makes this site possible. Main Banners are displayed at the top and bottom of every page of the site in rotation with 7-15 other active banners for that day, plus all active main banners are displayed of the top of digest, within the table of contents. We offer standard size (728 x 90 pixels) or Jumbo size (728 x 135 pixels - 50% taller). Each Main Banner gets about 2,000 views per day. Side banners are displayed on the homepage and category index pages of the website. Side banners are 300 pixels wide and can vary in length from 250 pixels to 600 pixels. 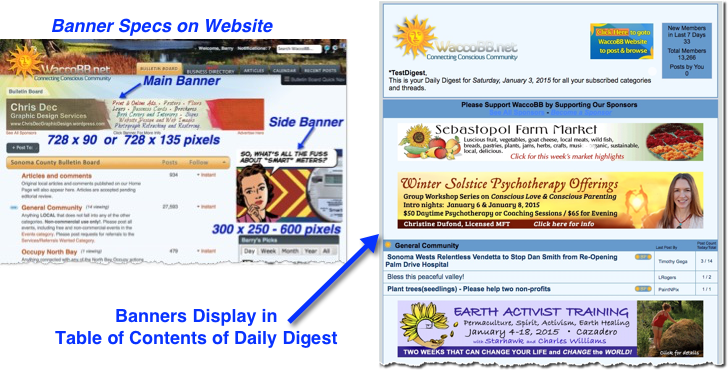 Side banner ads run daily for the number of months chosen, with no more than 7 side banners being active for a given day. The banners function as big buttons. Clicking on them takes the user to a predefined link, typically your website or your post on WaccoBB for further information. Your banner can either be a single image (pause) or multiple images that rotate. You can provide the banner image or we can design it for you. Additionally, You are free to use the banner image within your posts on WaccoBB, your website, or any other elements of your marketing collateral. Banners can be set up to run daily or for specific days a week. For long term marketing we recommend running a banner one, two or three days per week, possibly with a more intense initial run to introduce a new business. Daily runs are also effective if multiple banner images are used (so different images can be shown different days of the week). 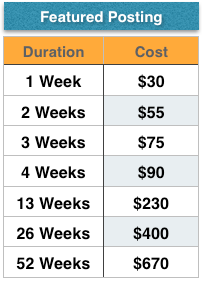 For event promotion, we recommend getting a monthly package to run over 3 weeks, with the fourth week doubled up on the 3rd week (run twice as often). You can have different banners running on different days of the week. The banner design process starts with working with you to identify the graphics and text elements to be included. We will then send you an attractive draft design for your review. You can request a set of tweaks if needed, and then we’ll produce the final. The whole process usually takes just a few days. You can have different banners different days of the week. 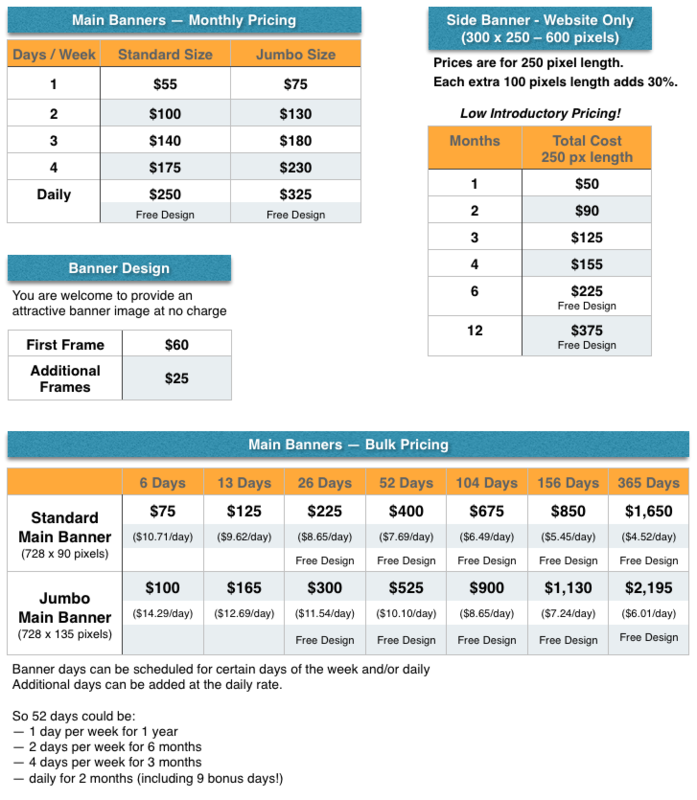 Banners get about 2,000 impressions per day and we can provide display and click through statistics on request. To get started with a banner, please . Standard and Premium listings include commercial posting privileges for associated events, sales or other timely offerings. Listing packages range from $75 to $300/year along with monthly and quarterly payment options. Over 40,000 pageviews over the last 12 months. 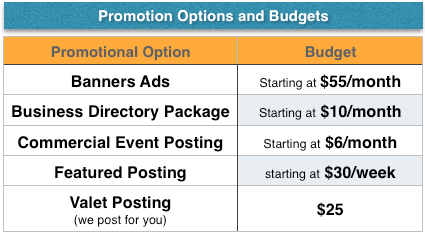 You can see pricing options and sign up your business here. If you have questions at our Business Directory Packages, please . 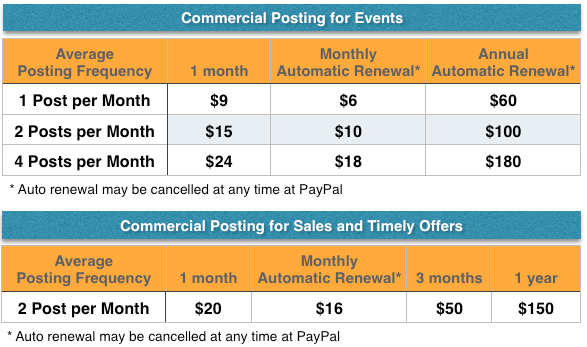 Commercial Posting is for events and other timely offers. Timely offers (ie sales) or other special promotions can be posted in the Sales and Timely Offers category. Posting privileges to this category is included in the Standard and Premium Business Directory listing package, but you can purchase a standalone membership for Sales and Timely Offers separately. (See pricing here). Postings stay on the website for at least 30 days, as the age down the list of posts in the category. 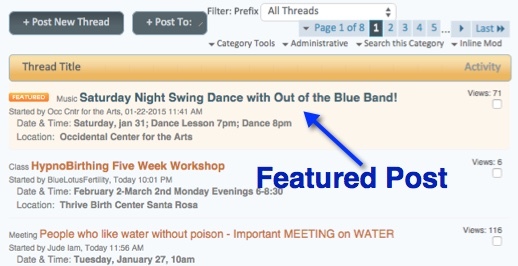 They go out in our Daily Digest email on the day they are posted, which goes out to over 6,000 registered members nightly. They benefit from our advanced Search Engine Optimization, giving them enhanced visibility to Google and other search engines. Commercial posting is largely self-service but we can provide a limited amount of support if needed to help you get started. If you have questions about commercial posting, please . You can boost the visibility of your commercial post by upgrading to featured post. Featured posts are highlighted and stay at the top of their category rather than aging down the list of posts in the category. This can be particularly helpful in our active Events and Classes category, but it can also be helpful in our Housing and For Sale categories. We are open to trades and will consider discounts for non-profit and community service organizations for Banner Ads. Contact Us for details. We reserve the right to only accept sponsorships that we feel are in alignment with our values and serve our community. I look forward helping you grow your business by using WaccoBB.net! Last edited by Barry; 04-09-2019 at 03:25 PM. Where did the name WaccoBB come from?